The innovative QTS & Android™ dual-system TAS-168 is an unprecedented network storage center for file storage, backup, remote access and — most excitingly — the greatest multimedia & app experience that you will ever have with a NAS! Powered by an ARM® v7 dual-core processor with 2GB RAM, the compact TAS-168 delivers good multitasking performance as a home NAS, and serves as a perfect media center for entertainment with its large storage capacity and HDMI output for 4K (H.264) media playback. Simply use the TAS-168 with a keyboard and mouse for the best experience. 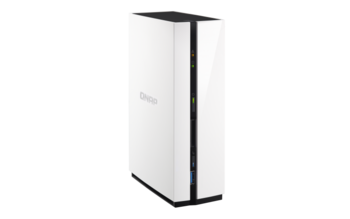 The QTS-Android Combo NAS is so handy to use, and the unlimited app applications makes it a must-have for modern digital lifestyles. The TAS-168 is the first NAS featuring dual systems - QTS and Android™. While QTS delivers efficient data transmission, rich multimedia functionalities and solid data security, Android™ administers the 4K (H.264) video playback over HDMI, runs Android™ apps, and can install apps from Google Play™. Both systems share the same storage database, so all your media files and documents can be accessed from QTS and Android™ simultaneously. You can use QNAP’s Qfile app to upload photos and enjoy them on HDMI display through Android™. Similarly, files downloaded from Android™ can be managed and shared through the QTS OS. With simple and efficient file storage combined with rich media playback applications, experience the power of the QTS-Android Combo NAS with the TAS-168! The TAS-168’s Android™ system provides the Google Play™ store and Qmarket. You can find various music, movies, books, and Android™ apps and games on Google Play™, and also download QNAP apps and access other app marketplaces from Qmarket. The combination of two app-centric systems allows you to enjoy infinite applications and fun. The TAS-168 has been completely certified by Google® and can synchronize with your Google® accounts. All the Google® files and settings based on your Gmail™ account can be synchronized and backed up to the TAS-168. You do not have to do any settings again. Backup and sync for contact lists and files are very convenient. Qsync utility turns your TAS-168 into a safe, large-capacity data center for file synchronization. Any file uploaded to the TAS-168 will be made available for all linked devices, such as computers, laptops or mobile devices. Qsync is especially useful for frequent travelers to manage files and always have the most up-to-date files on different devices. You can also install the Cloud Drive Sync app from QTS App Center to easily sync files with Google Drive™ and Dropbox® cloud storage. The TAS-168 supports SMB/CIFS, NFS, and AFP protocols for file sharing across Windows®, Mac®, Linux®/UNIX® networks. Data, logs and ISO images of CDs and DVDs can be centrally stored on the TAS-168 and protected by an integrated antivirus solution.